A friend always toy with his name on Facebook a lot, so after some changes, he started receiving a notification – “You can’t update your name right now because you’ve already changed it too many times”. He asked me why he was seeing such notification. And my response was that Facebook only allows user to change their name for a specified number of time, after which they will not be able to change it again, except if they want to choose one of the names they’ve used before. Aside that, if you don’t want any of the previous names you’ve used, but want a new name entirely, then you will have to follow the simple steps I outlined below. It worked for my friend that plays with his Facebook name. Changing your Name on Facebook after you’ve crossed the allowed limit is quite easy. All you would be required to provide are your First Name, Middle Name, Last Name, Reason for the Change and finally, you would be required to upload a copy of your government-issued photo ID so that they would be able to confirm that it’s your account. Step 2 – Fill the required information. Step 3 – Click Send Button. 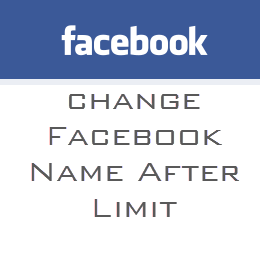 Step 4 – After you send it, Facebook said it will take up to 48 -72 hour to change your name. My friend told me that the he made the ID he used with photoshop and added a troll face on a fake hospital ID. He said his name was changed instantly. That simply means Facebook don’t actually check the ID uploaded. Share your experience with this trick via the comment section below. If you also have any other method, don’t hesitate to share it. I tried this about four times my name is still not changed. Try it again in a week time.